HeartSine Samaritan PAD 450P is an automated external defibrillator (AED) that analyzes the heart rhythm & delivers an electrical shock. 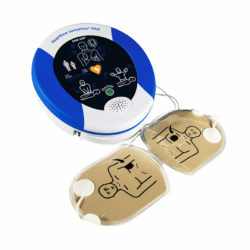 The HeartSine Samaritan PAD 450P is a sophisticated defibrillator for adult or pediatric use. Features a lightweight and easy-to-operate system. Compact and lightweight. 56% smaller than other AEDs it only weighs 2.4 lbs (1.1 kg). Highest level of dust/moisture protection. Durable. Resists shock and vibration. Low cost of ownership. The 450P uses HeartSine’s practical Pad-Pak™, which incorporates the battery and electrodes in a single-use cartridge – meaning only one expiration date to monitor and only one item to replace after use. The cartridge has a shelf life of 4 years from date of manufacture, offering significant savings over other defibrillators that require separate battery and pad units. User-friendly. 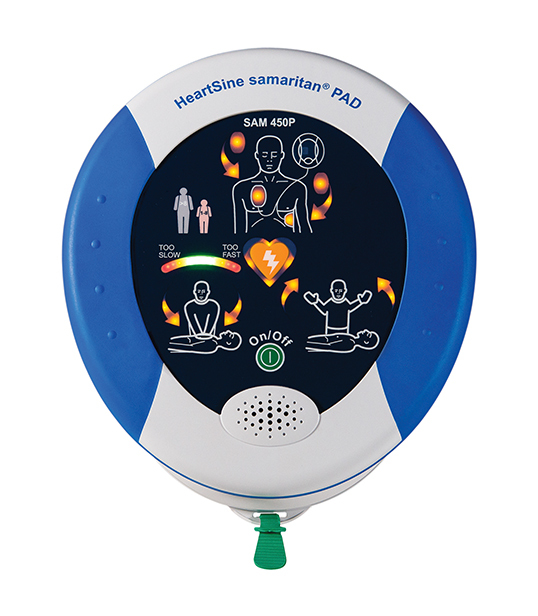 The Samaritan PAD 450P features easy-to understand visual and voice prompts that guide a user through the process. Three large, easy-to-see icons facilitate the rescue process: “Attach pads,” “Do not touch the patient,” and “It is safe to touch the patient”. Pediatric-Friendly. The 450P is suitable for use on adults and children. For children younger than 8 years or weighing less than 25 kg (55 lbs), a Pediatric-Pak™ is available. HeartSine automated external defibrillators come with an 10 year unit warranty. Think that the HeartSine Samaritan® PAD 450P is the one for you?